Summer presents an ideal time of year for aspiring surfers to hit the beach and develop their wave-sliding skills. With the North Pacific's winter storm and swell pumping machine on simmer, summertime generally brings beginner-friendly waves to the West Coast. While there are exceptions with occasional large swells sent northward from the southern hemisphere or from tropical hurricanes developing near Mexico, summertime surf is more often than not under 4 feet and more approachable than the winter or shoulder seasons. Not all coastline was created equal, however, and with over 1,200 miles of ocean shore stretching from northern Washington to southern California, certain spots offer better summertime waves, ocean access, and navigable conditions for beginning surfers. While not exhaustive, we've compiled a list of West Coast beaches, south to north, that are well suited for learning to surf during summer. Summertime surfing in the Pacific Northwest. Photo by Tyson Gillard. Staying warm: During summer, ocean temperatures in Northern California and the Pacific Northwest can be 25 degrees colder than Southern California. North of San Francisco you'll most likely want to have a warmer wetsuit with a hood (5/4 mm or 4/3 mm) versus a 3/2 mm wetsuit or even trunks/swim suit for certain areas times further south. Surfboard: Starting off with a longer more stable surfboard makes it easier to catch and stand up on waves, so you're learning and surfing more rather than bobbing around watching others catch waves. Foam based soft-top boards are a great option. Wind, swell, weather and tide all have an impact on surf conditions for any given break. Mornings typically offer clean and calmer conditions, while afternoons at certain spots can be messy due to onshore sea breezes that are regular during summer. Other breaks are set in coves with headlands or bends in the coastline that provide shelter from winds throughout the day. Check with a local surf shop on the best conditions for learning at a given break. Whitewater vs. the lineup: Let's face it, beginning surfers aren't going to achieve Kelly Slater status their first season of surfing. It's best to take it slow and ease into the surf at any new spot, avoiding the main lineup. Often the best place for learning is staying inside the main surf break closer to the beach within the whitewater area where you can learn the feel of water pushing you while paddling and how to efficiently pop up. You're odds and rate of learning to surf increase exponentially when you can find some tutelage. This applies to the form, movement and sport of surfing, as well as learning about the ocean and surf conditions at the spot you will be surfing at. Having a mentor, be it a friend or an instructor, is the safest and surefire way to improve your surfing abilities. Safe and respectful surf etiquette is one of the most important aspects of surfing. Learning things like whether you should paddle on a wave that someone else is surfing on, where to paddle out, and what part of the surf spot is best for beginners are all parts of surf etiquette that well help keep surfing safer for everyone and reduce the chance of sparking frustrations among other surfers in the water. Seek knowledge on surf etiquette from friends and during lessons and watch experienced surfers before paddling out to a new spot to learn surf local protocol before heading into the water. Please help steward these amazing coastal areas by keeping the beaches and ocean clean and helping pick up trash you see that others may have left behind. Surfers at Surfrider Beach in Malibu. Photo by Tyson Gillard. Tourmaline Surf Park/Pacific Beach - San Diego's user-friendly surf break on the north end of Pacific Beach. San Elijo State Beach - A nice state beach with a mile of surf beach and reef breaks near Cardiff and Encinitas. San Onofre State Beach - One of the oldest surfing zones in the U.S., this north San Diego County spot is rich in surfing history and mellow long boarding waves alike. Malibu Lagoon State Beach/Surfrider Beach - California's most famous right-hand point break in the heart of Malibu. Expect crowds. The inside area is best for beginners. Sand Dollar Beach - When the waves are small here in summer, the southern section of the cove can be a wonderful spot to get wet among Big Sur's wild and rugged setting. A good spot to learn in the whitewater. Pleasure Point - One of the many Santa Cruz right-hand point breaks with multiple spots along the point. 38th Avenue (further south) is a good spot for beginners. Cowell Beach - Great sand bottom long board and beginner spot on Santa Cruz's west side. Beginners should stay in the inside area. Plenty of lessons available. Pacifica State Beach/Linda Mar - Perhaps the Bay Area's best beginner-friendly break. Located south of San Francisco. The southern end of beach is best for beginners. Bolinas Beach - Regular beginner-friendly summer waves in Marin County with a beautiful backdrop courtesy of Bolinas Ridge. Trinidad State Beach - Similar to Sand Dollar Beach above, when summertime surf is small this is an idyllic Northern California beach set amongst a spectacular wild setting near Arcata. Otter Rock - Less than 10 miles north of Newport, Otter Rock typically has small summertime waves well suited for learning. Pacific City - Semi-sheltered stretch of beach on the southern side of Cape Kiwanda. Great summertime spot for beginners. Lessons available. Short Sand Beach - Set amongst one of the most beautiful coves in Oregon, this is a popular surf destination for northern Oregon residents. Beginners will enjoy the whitewater when the swell is up. Indian Beach - North of Cannon Beach in Ecola State Park, this beach is a bit more exposed to swell and wind. Beginners should stay within the whitewater. 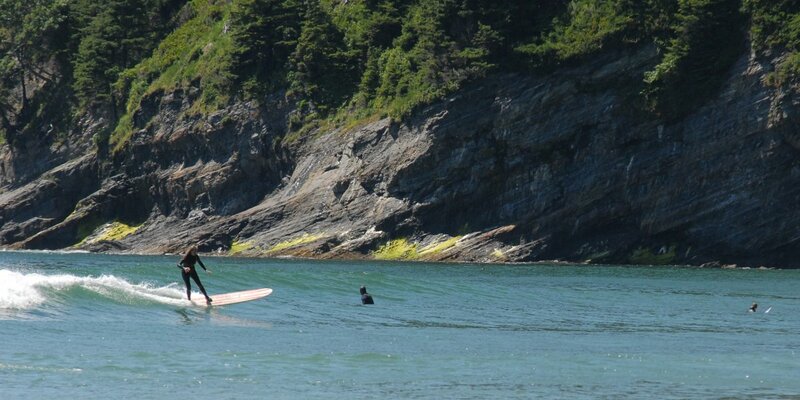 Westport - Needs to be small (summer only) for learning to surf. Gets big and dangerous the rest of year. Beginning surfers will enjoy miles of summertime beach break along Westhaven State Park, also referred to as "The Jetty." Lessons available in Westport. La Push - Dramatic coastline with offshore haystacks along the Olympic Peninsula near Forks, Washington. First Beach and Second Beach offer good surfing opportunities for beginners during summer.